Are kids fair game for junk food advertising? There are regulations in place to protect younger children from junk food advertising on TV. But it seems that some confectionery manufacturers could be targeting children through games on their own websites. I enjoy more than my fair share of chocolates and sweet treats. When I’m buying a sugary snack, I can’t help but notice how many products on the shelves are brightly wrapped, just crying out for my attention. Some of them have cartoon-style characters emblazoned on the packaging, while others are covered in smiley faces or rocket ships. Now, I’d like to think I’m fairly grown-up and can resist the allure of cheery packets. Most of the time, anyway. But it must be tricky for a parent to take their child into the supermarket or newsagents and resist the temptation to give in to cries of ‘I want the princess sweets, daddy!’. The best course of action is probably to avoid such temptation altogether and keep a safe distance between your child and the sweetie aisle. Although some shops make that tricky by displaying sweets right by the checkout. As a result of campaigning by Which? and other public interest groups, we now have fairly strict broadcasting regulations in place to prevent junk food being advertised to children on television. So you’d be forgiven for thinking that kids are well protected from sugar-pedalling cartoon creatures when they’re not in the supermarket. The concept of scheduled TV viewing is also disappearing, as more of us consume shows via on-demand, catch-up services. Restricting advertisements to particular times of the day seems less relevant to tech-savvy children. Unfortunately, it also turns out that food industry advertising codes don’t apply to manufacturers’ own websites. 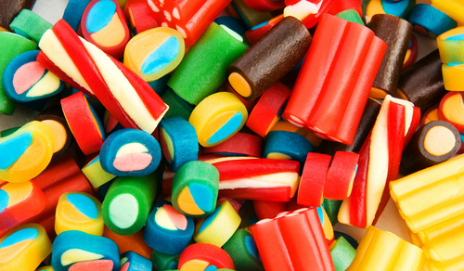 The Children’s Food Campaign has complained to the Advertisings Standards Authority about 54 confectionery manufacturers’ websites that promoted products to children that were high in fat, salt or sugar. Only two complaints were partially upheld by the ASA, but the websites show how the battle to win over young consumers is moving away from TV and onto our PCs. Most young children probably don’t have much of a disposable income to spend on snacks, so manufacturers could be gambling on pester power to boost sales. I find it scary how quickly a five-year-old can pick up a catchy jingle and start singing it over and over. And over. Have you noticed junk food being advertised online? Was it aimed at adults or kids? Do you think that advertising unhealthy foods to children can be justified? Are the costs of parking fines out of control? Pester power aided and abetted by some supermarkets. Young children and sometimes old ones are tempted by the chocolate and sweets display beside the tills in my local Marks and Spencer store. I quite often see a three to five year old doing the ‘shame the parent into giving in’ song and dance by the till in the store. The parent usually gives in and buys the sweets for the little one, just to avoid further embarrassment. Waitrose is much more parent friendly and have no such temptations by their tills. Alice says: The situation will worsen so long as advertising remains ‘self-regulated’ via the ASA, and the government takes its public health advice from junk-food sponsored industry reps who chair key committees within SACN (Scientific and Advisory Committee on Nutrition). Sweets at the checkout are not great, but not the real issue – its sweet junk marketed as healthy food for kids. “Enjoy Nesquik as part of a balanced diet and healthy lifestyle”. Almost one third of the calories are ’empty’, coming from added sugar and HFCS, about 4tsp. And finally the “…as part of balanced diet” piece of PR mumbo-jumbo, used to justify poor quality sugar-laden junk wherever its sold. We should really be immune to this cokespeak by now. Christmas dinner: will Yorkshire puddings be on your plate?